Elitesingles.com is a great place for seniors to find a connection whether it be fore a casual dating partner or a love interest. There is someone on there for everyone. Users can easily browse through other users to find someone they are interested in. It’s the perfect senior dating site for anyone over 60. Singles over 60 can browse through other singles in their area to meet with someone who suits their fancy. One of the best features is the ability to browse though senior and message them directly from the website if you are interested. It keeps a sort of anonymity while the couple gets to know each other. The site first allows you to fill out a personality questionnaire. Once you fill it out the site will give you potential matches every day. It even does most of the work for you. It is a great way to easily find other singles because it does do the personality matching. This allows you to find someone who is most compatible for you. You never have to worry about ending up with someone who you have nothing in common with because the questionnaire solves that. I have found that there is not as many users as I would hope, but I feel like that will change as the word gets out about the site. One of the best things is the way it gives some anonymity during the dating process. You can chat on the site all the way up to the date to avoid giving out phone numbers if you are not ready for the step. It makes it easy to move forward if the date doesn’t work out as well as you would have hoped. The site is so easy to use. It is as simple as answering a few questions and clicking on a person you want to meet. There isn’t a lot that can go wrong. Even a beginner can use the site. The whole site is very user friendly. Overall, I think this is the perfect site for anyone over 60 looking to find a new love interest. It gives you the ability to find new people like you every day without any work. It is very easy to use and gives you the ability to keep your privacy while getting to know each other. 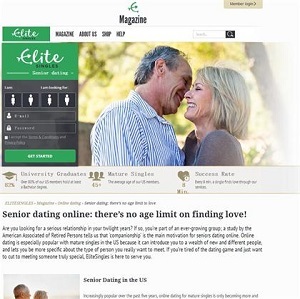 If you’re a senior looking for a date elitesingles.com is the way to go. All uploaded photos must be checked and approved by the EliteSingles team. Only after approval can they be made visible to other members. Basic members can view your personality test results, receive partner suggestions, send smiles and likes and upload photos. As a Premium member, you can send and receive an unlimited number of messages, leave comments on others’ profiles and photos, view who visited your profile and more.